I ALWAYS START A NEW NOTEBOOK AT THE BEGINNING OF A NEW YEAR. IT JUST MAKES SENSE TO ME. A WHOLE NOTEBOOK FULL OF BLANK PAGES TO FILL OVER THE NEXT TWELVE MONTHS. IT'S SO EXCITING AND DAUNTING. AS WE'VE RETURNED FROM OUR ANNUAL WINTER BREAK (THE WEEK BETWEEN CHRISTMAS DAY AND NEW YEARS DAY), ALL OF US HERE AT THE FOUNDRY HAVE BEEN STARTING NEW NOTEBOOKS AT THE SHOP, TOO. 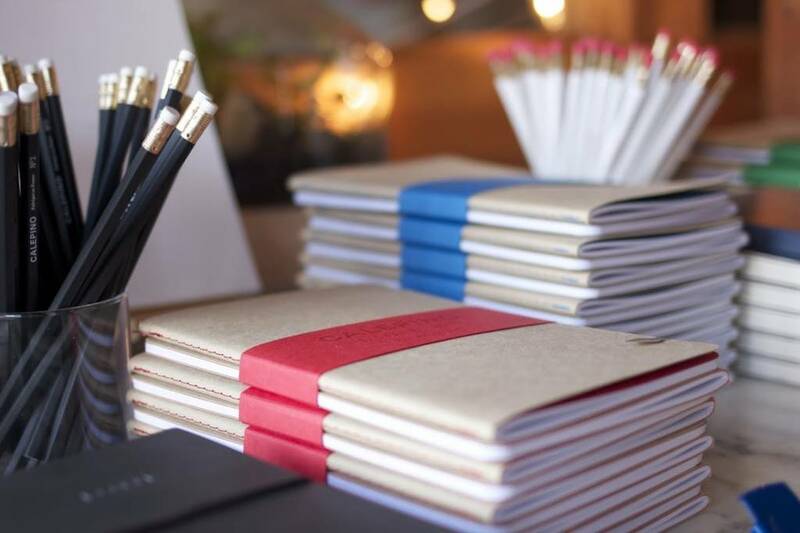 NOTEBOOKS TO FILL WITH OUR DAILY TO-DO LISTS, OUR WEEKLY PLANS, AND OUR BIG PICTURE DREAMS FOR THE FOUNDRY HOME GOODS. AS WE DIVE INTO A NEW YEAR OF PROJECTS, UNDERTAKINGS, AND ADVENTURES, WE HAVE TO SAY THANK YOU FOR BEING PART OF OUR HOLIDAY SEASON AND OUR PAST YEAR. 2014 WAS A YEAR OF CHANGE, GROWTH, LAUGHTER, SOD PARTIES, AND NEW MEMORIES FOR OUR FOUNDRY FAMILY SCRAPBOOK. WE'VE SAID GOODBYE TO DEPARTING FAMILY MEMBERS AND HELLO TO NEW, WONDERFUL MEMBERS; WE'VE DISCOVERED AND CREATED CONNECTIONS WITH FANTASTIC NEW ARTISTS, WHILE DEEPENING AND STRENGTHENING OUR RELATIONSHIPS WITH THE ARTISTS WHO HAVE BEEN WITH US OVER THE PAST COUPLE YEARS. WE FEASTED ON PIZZA AND CHAMPAGNE ON OUR URBAN LAWN, SAW THE RETURN OF THE #DAFFODILBOMB, CHASED OUR ESCAPEE ROOMBA OUT INTO THE INTERSECTION OF N 1ST STREET AND N 2ND AVE, WRAPPED UP THE HOLIDAYS IN A FLURRY OF BROWN PAPER AND ITALIAN RIBBON, AND ARE BACK FOR 2015 STRONGER THAN EVER. THANK YOU FOR BEING HERE WITH US, NOW AND IN THE FUTURE. IT MEANS THE WORLD TO US!